SpongeHenge (Episode) – From SpongePedia, the biggest SpongeBob-wiki in the world! 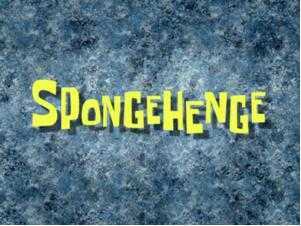 "SpongeHenge" is an episode from Season 5. SpongeBob becomes musical when a storm of destructive winds occurs in Bikini Bottom, causing jellyfish to become attracted to him. He tries to get to work but the wind is too strong and the jellyfish refuse to let him go to work. He hides in a cave and builds stone-replicas of himself to attract the jellyfish. Many weeks later, he comes out from hiding just to find that the destructive storm has caused the Krusty Krab to be engulfed in sand, upsetting SpongeBob and he yells out: Noooooooo!. It's unknown what happens next to SpongeBob but SpongeHenge contuines to live on. 3000 years later, alien journalists discover the circle of SpongeBob Stones that attract the jellyfish. The title is a spoof of the monument Stonehenge. This is Barbara and Bob's second appearance, the two first appeared in episode Krusty Sponge. The scene where SpongeBob is in a cave hiding from the jellyfish and making a stone buddy is a reference to the movie Castaway. It's likely that the winds hitting Bikini Bottom were hurricane force winds as they were knocking buildings down, like the Krusty Krab. The plot to this episode is somewhat similar to the episode "Jellyfish Jam". This is the first time a weatherman appears in the series. Patrick eats Kelp Cream in this episode, it is a spoof of whipped cream. This episode was aired on the first day as part of Nick's Nonstop Five at Five. This is the second time SpongeBob's fingers are too big for the buttons on the telephone. The first was in Suds. Showrunner Paul Tibbitt was credited as the Moon, and voice actor Dee Bradley Baker was credited as the Sun. The faces on the moon and sun is a reference to Teletubbies, where there is a baby's face on the sun. There is a book based on this episode. SpongeBob tells his first stone SpongeBob that he can have all the "sugar" but SpongeBob gives himself some of the "sugar". This page was last modified on 30 July 2017, at 17:59. This page has been accessed 35,971 times.